Based on Disney’s epic animated musical adventure and Edgar Rice Burrough’s Tarzan of the Apes, TARZAN features heart-pumping music by rock legend Phil Collins and a book by Tony Award-winning playwright, David Henry Hwang. 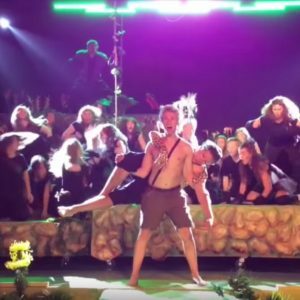 70 youth’s crazy energy and hits like the Academy Award winning “You’ll Be in My Heart” as well as “Son of Man” and “Two Worlds” made TARZAN an unforgettable theatrical experience! TARZAN Performed June 18, 19, 20, 22, 23, 27, 29, 30 and July 1, 2015. Special thanks to South Jordan City, ZAP, Butler Tax and Accounting, eBay, and Vivint for helping make these events possible!